Having missed Yasuhiro Yoshiura’s indie production, Pale Cocoon upon its release in 2004, it was possibly intentional on my part to ignore the man’s works until I had a full on chance to see where he began. And to see that he had also been involved in numerous support roles in recent shows including Rebuild Of Evangelion, it only felt right to finally dive in, and see where he stood amongst other indie luminaries such as Makoto Shinkai. How little I knew how much I wold actually grow to admire his potential after finally seeing Pale Cocoon for myself. Even if it is a pretty scrappy piece of work, and offers little to grasp onto writing-wise, I was impressed by his visual style, and wish to tackle some heady science-fiction regarding human neglect and its will to better grasp the hows and whys. So finally, the chance came to explore his first full-blown series experiment in the form of a six episodes that were released as online only. (streaming for the series began with episode one in October of 2008, and streamed the finale in September of 2009) Unsure of such a proposition, there indeed was a little worry on my part going in, but it can now be safely said that Yoshiura has himself a compelling creature in the form of Even No Jikan. And as of this writing, the series has not only completed its brief run, but has also experienced a theatrical version run earlier this year. And there are few shows today, so willing to merge the shell of anime & the thoughtfulness of good science fiction that this comes as a grand exhale of minty cool in an era bereft of anything but disparate gimmicks. It is here that Rikuo & Masaki begin to meet the cafe’s few patrons, and within six brief episodes, explore their own feelings on a world populated by machines from those created by man, and those self-made by a society afraid of its own shadow. The social implications of a populace surrounded by subservient creations has been a staple of not merely anime, but of literate science fiction for well over several decades now, and Yoshiura’s short series is definitely another in this pantheon, but has an interesting distinction in how it treats the subject matter with an unexpected reverence for Asimov’s concerns, and places them in a more intimate setting. Watching the complete series, there are only five settings throughout the entire project, the majority of which takes place in Eve No Jikan as the undisclosed nation outside brims with a growing miasma of prejudice against the mechanical whom have comfortably nestled into every part of the societal body. Many stories have covered this material before, but to take the quiet , kuuki-kei approach is a novel one closer in tone to an episode of The Outer Limits than Blade Runner, that is, if TOL had an episode comfortable with a cup of coffee and good conversation. Each episode centers on Rikuo’s reaction upon getting to know each patron on a new level, as the publicly mandated “haloes” are removed, and the machines take on a more relaxed, almost human form in the safety of the cafe. Among the unique visitors to the establishment are chatty Akiko, enigmatic couple Koji & Rina, playful child Chie and her elder guardian Shimei whom each bear a tale placing pre-established beliefs into question. All the while, a world less understanding in the form of the little known, but media strongarm movement known as The Ethics Committee is making moves against robot-safe regions known as Grey Zones in greater metropolitan areas. The contrast between Rikuo’s growing understanding of a changing world, as well as the building tension within the less-than receptive Masaki (who’s background makes for an interesting, albeit simplistic counterpoint) make for a quietly escalating war of notions on what it means to integrate our mecha brethren into our daily lives. And even as these oft-told stories have indeed been a part of anime & manga for quite some time, Yoshiura’s take is a much more a thinly-veiled look at the modern japanese experience, than another robot parable for the ages. As Rikuo begins to peel past the layers of what he had once understood about his world, it is clear that he himself has long put away vital feelings in order to better align with the group dynamic. From seeing how Sammy regards her so-called owners with respect, and maybe even adoration, Rikuo starts to see the blurring of any lines that had once been placed there by a young public, unsure exactly why it felt so compelled to create simulacra capable of expressing what they themselves cannot. In the ideal eyes of cafe hostess Nagi, empathy akin to hers is something often placed aside in the outside world, and has helped fashion an environment where dependence on the indirect nature of the masses has no application. From the glowing haloes hovering over the heads of programmed servants outdoors in a grand means to delineate human from machine makes for an interesting look at aesthetic dependence in hopes of maintaining an image of order in a time where so many are in fact not on any grid whatsoever. The self-imposed denial of externalized feelings has been relegated to prime status, as progress marches on with a public trapped in an eternal adolescence, completely unsure of what to make of the new world they have created. It is also telling in the series how machines are often treated with the stressful disdain of meaningless objects, while those closer with their mechanical counterparts are being seen as a social anomaly. Rikuo’s growing respect for the folks of Eve No Jikan runs counter to popular belief, and thus brings some burning dilemmas to light in what could easily have been another CG-laden blob of nonsense. Much like the id-pressure valves video games can offer us, it is easy to succumb toward objects with the same kind of general disregard, but as Eve No Jikan displays (as did sections of The Animatrix-most notably Mahiro Maeda’s The Second Renaissance), the treatment of those who share a resemblance toward their creators gives us a stark look into our disconnected natures. So just as the show helps us better see the robots as potentially sympathetic creatures with personalities & frailties of their own, it gives us a more contextural view of this dilemma than merely fiery violence, and robogore. More interested in the subtle, Yoshiura’s theme playfully shows us more than tells. Something that is also refreshing in anime series of this kind. There is even room for sly humor when an outdated pre-humanoid model shows up, demanding the treatment given to any patron, nasty glitches and all. Despite the budget upgrade from Cocoon, the series is clearly done with limited means, and takes full advantage with some often lovely production savvy that can compete with some of tv’s strongest works over the last decade. At times it’s a lovely mix between 3D and 2D, and offers some lush images rife with a muted coffee color that invites a more relaxed atmo, perfect for the stories inherent. Also worth nothing are fine performances by Rie Tanaka, Kenji Nojima, & even Ritsuko Akagi herself, Yuriko Yamaguchi who bring an almost retro-feel to the proceedings. There are also weaknesses as the pacing at times feels a little unsure of itself early in the series, but soon after, it begins to pick up once the writing becomes a lot more comfortable with the setting. It becomes clear later on that there were characters they were much more interested in exploring come later episodes. So all in all, the world of Eve No Jikan seems ready to expand into other areas as it all ends on an incomplete note. Whether or not this comes to pass, I personally am fine with brevity. But the series does offer enchantments few shows can with such a limited budget. There is truly a large scope outside the walls of this place, but perhaps it is up to us to fill in those gaps with what it is we intend to bring to the discussion. Curious? Eve No Jikan can be caught on Crunchyroll! Another dialogue, this time about the issues raised by Eve no Jikan. As you can see this is going to become a regular series. Mike: I have a question. Why would people create androids that had the potential for intelligence in the first place, when it’s clear they are so uncomfortable with it? You have to purposefully design a robot or android to have human-like intelligence. Couldn’t they have just made robots who could never turn their halo off and would never question their masters? Ray: I think you found a plot hole more than anything. Unless somebody decided that the halo was the restraining device, but somehow somebody hacked it. But in any case, I certainly never thought about that. Eve no Jikan 2 – who has the right to own you? Do you have the rights to move as you please? Are you allowed to function beyond your proscribed limits? Rikuo is dealing with that right now as we speak (in the creator’s mind). 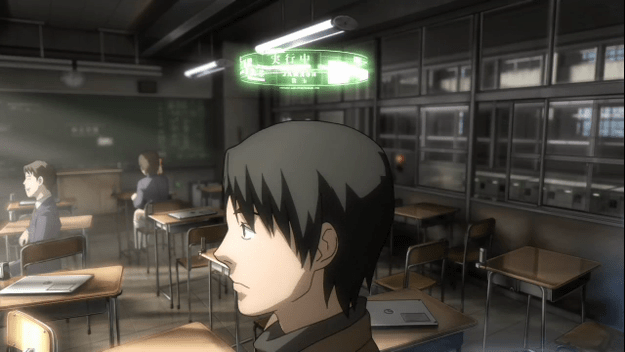 Eve no Jikan / Eve’s Time – emotion chip on Data and Replicant running amok.